Oletko aina haaveillut tekeväsi leiskaasi jotain erityistä? Kokeilla uutta tekniikkaa? Skräpätä ison kuvan? Käyttää tiettyjä papereita, jotka olet säästänyt juuri Sitä leiskaa varten? Nyt on aika haastaa itsesi! Tee haaveestasi totta ja kokeile jotain uutta leiskassasi! Have you always dreamed about something special on your layout? Trying a new technique? Or to scrap a big photo? Or to use certain papers which you have? Now it is time to challenge yourself! Make your dreams come true and try something new in your layout!" Our lovely and always inspiring guest designer for this challenge is Marsha Valk! “ I had purchased a packet of clay some time ago. I had read about paper clay some time ago and wanted to try and make embellishments with it. But I wasn’t sure if I had bought the right clay and I hadn’t taken the time to try it out yet. The packet was just sitting on my shelf, staring at me from time to time. So when I was asked to challenge myself, I knew it was time! The clay I used is air drying. The drying process took a lot longer than I expected, but the result was really nice and light. I would say the dry pieces feel like paper. I tried Distress Inks on them and they seemed to take those well. I sprayed some with Glimmer Mist too, and as long as you don’t get it too wet, it will be OK, but the clay will dissolve when too moist. In the end I liked the crisp look of the plain white the best and I felt the clay pieces deserved to be the star of the project. So my second goal was to not let myself get carried away with product. I haven’t created something clean and simple in a while, but my subject actually made it pretty easy. The name and colour of the bottle forced me to use a colour I don’t usually go for. I didn’t have to bother with going through my stash, because I knew there wouldn’t be a lot of dark blue/indigo/purple products there. I did have a set of Denim blue Thickers that came with a recent Studio Calico kit and I own a couple of suitable spray inks. I also thought the use of spray ink was particularly clever for a lay out about perfume :-). Another thing that I like and I hardly ever use is the Dotted Swiss cardstock. I thought it would be hard to write on it, but it surprised me how smooth it went! All in all I really liked the playing with clay and I made quite a stash of clay embellishments, so who knows how many will pop up on future projects ;-). Ohjeet osallistumiseen löydät täältä, ja haasteeseen on aikaa osallistua 12.8. saakka. / This challenge is open until the 12th of August. Please check here how to participate. Scrap365 is a new and vibrant scrapbooking magazine. As our strap line (for scrappers who do it every day!) suggests the magazine is aimed at keen scrapbookers who love and live their hobby. 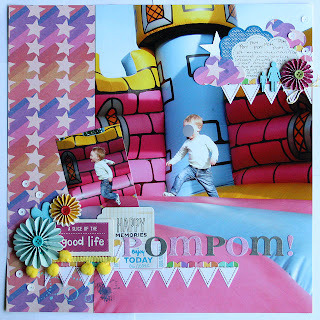 We provide inspirational tutorials and clever, original ideas to make your scrap projects really sing! Our focus is on adding creativity and using techniques, with many ideas clearly explained in step-by-step images. 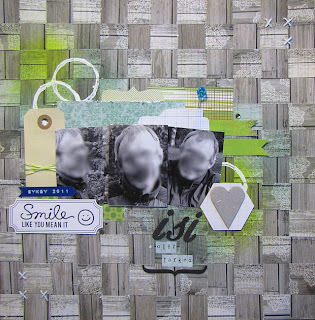 Scrap365 has a wide range of articles reaching beyond the traditional 12x12 layout; mini albums, digi scrapping, art journaling and off the page creations all feature prominently. Check out our blog (scrap365.blogspot.com) for the latest news or visit www.scrap365mag.com to subscribe to the magazine in print or digital format. Scrap365 on uusi britannialainen skräppäyslehti. Kuten ohjenuoramme (skräppääjille, jotka tekevät sitä joka päivä!) ehdottaa, lehti on suunnattu innokkaille skräppääjille, jotka todella rakastavat harrastustaan. Takaamme inspiroivia tutoriaaleja ja ovelia ideoita jotka saavat työsi puhkeamaan kukkaan! Keskitymme luovuuden lisäämiseen, eri tekniikoiden käyttämiseen ja monien ideoiden selkeään ohjeistukseen vaihe-vaiheelta kuvin. Lehdessämme on monipuolinen skaala artikkeleita aina 12x12 sivuista digiskräppäykseen ja art journaleihin. Blogistamme (scrap365.blogspot.com) näet uusimmat uutiset, ja lehtemme pystyt tilaamaan osoitteesta www.scrap365mag.com joko tavallisessa tai digitaalisessa muodossa. Mukavaa illan jatkoa! Jatketaan juttua jälleen huomenna! ~ Have a lovely evening! We'll be back tomorrow morning! Anniska: I love your background! I have never tried that myself... but I understood that you found it quite easy? Have to give it a go then :-). Tutteli: Love the vibrant colours you used! Don't you just love big photos? I hope you will use them more often now! Thank you both for having me! And I love the colours of your LO and that perfume as well :) Thank you very much for being a guest designer! I love the feeling of your layout, it has such a special, soft, feeling. Thank you Marsha for joining our event as a guest designer!